The system supports DFS (Dynamic Frequency Selection) for improved signal reception. Each receiver can accept signals from up to four SKYPLAY-DFS-S transmitters; this allows you to use one receiver to switch from up to four sources. The pair feature less than one frame signal delay, this means that any transmission delay is virtually unnoticeable. The system is HDCP 2.0 compliant, supporting EDID passthrough, so that your HDMI source and monitor will work just as they would if an HDMI cable connected them. The SKYPLAY-DFS-S Wireless HDMI Distribution System with Dynamic Frequency Selection Transmitter from Intelix distributes HDMI high-definition audio and video up to 100 feet in both point-to-point, point-to-many, and many-to-point configurations. Each transmitter is compatible with up to 4 separately purchased receivers, and each receiver can be paired to switch up to 4 transmitters. The SKYPLAY-DFS-S can transmit 1080p video with stereo or multichannel audio. The SKYPLAY-DFS transmitter and receiver must be paired together to pass video. The SKYPLAY-DFS radios are configured for operation in the US and Canada. 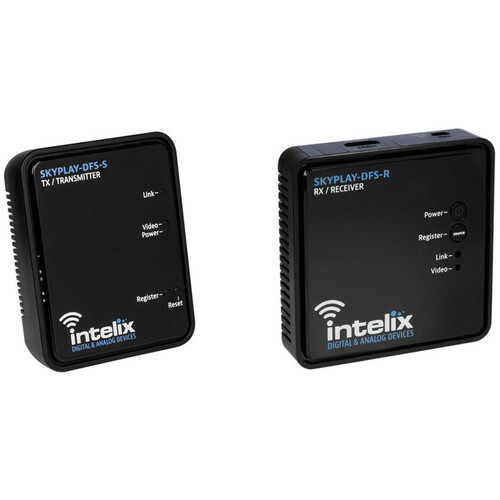 The SKYPLAY-DFS-R Wireless HDMI Distribution System with Dynamic Frequency Selection - Receiver from Intelix receives HDMI high-definition audio and video from up to 100 feet in both point-to-point, point-to-many, and many-to-point configurations. Each separately purchased transmitter is compatible with up to 4 receivers, and each receiver can be paired to switch up to 4 transmitters. The SKYPLAY-DFS-R can transmit IR signals from the remote location to control the source device. The SKYPLAY-DFS transmitter and receiver must be paired together to pass video. Box Dimensions (LxWxH) 10.8 x 7.2 x 3.1"
Box Dimensions (LxWxH) 10.7 x 7.4 x 3.2"
SKYPLAY-DFS Wireless HDMI Transmitter & Receiver Kit is rated 2.0 out of 5 by 1. Rated 2 out of 5 by Anonymous from These units would only work up to 50 feet The manufacture claims this unit Will perform up to 100 feet. With only one sheet rock wall between the transmitter and receiver unit performed well up to about 50 feet. After that they constantly lost sync and was not suitable for our application. Here is the basic 2 prong USA to 2 prong Europe converter we sell. This should be the correct one. How much add one more receiver? This system comes with 1 transmitter and 1 receiver, however the Skyplay-DFS can connect up to 4 receivers. B&amp;H # INSKYPLAYDFR is for a single receiver, which you could add to this unit to make it a 2 receiver set-up. Will this work with a video switcher ? Just as long as your video switcher has an HDMI input this Wireless Kit should work well. Just make sure you are staying within the transmission range, which is about 100 feet. If the system is paired and operating and I remove power from the units, can I then apply power again and the units operate or do I have to pair the system again? Yes, they will stay paired (at least ours does). We've had no issues with our unit, works as advertised, would recommend. If i buy 2 transmitters and 1 receiver, how can i swich between the 2 transmitters? I don't know how you would be able to do this. I use this transmitter but I have no need for two of them.